Blues and Country music are distinctly American, with deep roots on the banks of the Mississippi River. 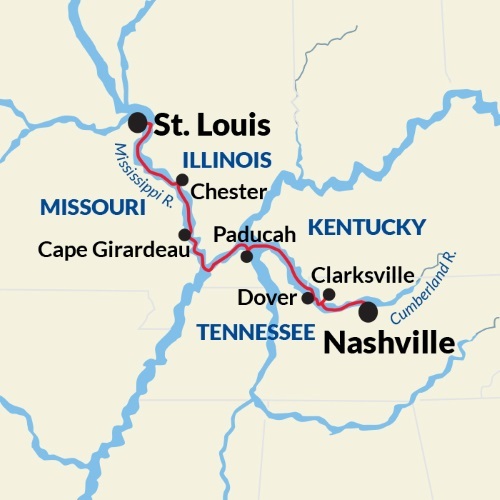 This theme cruise explores Nashville, known as "Music City,” home to the Country Music Hall of Fame and Museum, the Grand Ole Opry, and the Johnny Cash Museum. The second largest city in Tennessee, Nashville maintains a vibrant music scene with a number of clubs, honky-tonk bars, and studios that continue the tradition of this city's musical heritage. The birthplace of Miles Davis, Roosevelt Sykes, and Ike Turner, the last stop on this musical journey is St. Louis. Synonymous with the blues, St. Louis has its own style and genre referred to as the "St. Louis Blues."